Make it: Start by boiling your eggs in cold water until you reach a rolling boil, then , cover, turn off heat, and let sit until needed. Next, Put your 1 1/2 cups broth, 1 1/2 cups water in a saucepan, bring to boil. Toss in 1 T fish sauce, 1 T miso, 1 t chili garlic paste, Juice from 1 lemon, 1 t sesame oil, and 1 T tamari. Let simmer. Julienne your carrots, slice your mushrooms and red pepper, and throw them, along with a cup of edamame in the saucepan. 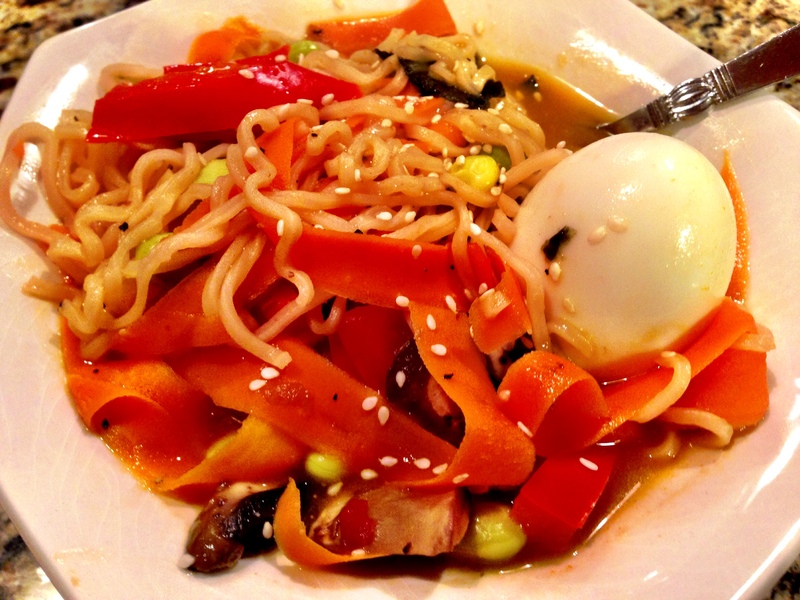 Add your two packages of Ramen (without the seasonings!). Crack open your boiled eggs. Throw them in your bowl of Ramen. Top your ramen with sliced green onions, and sesame seeds and enjoy! Review: Yummy, I added one red pepper and lots of garlic and it was definitely a hit! Making this again, for sure! Review: I guess I wasn’t a big fan.. I would have liked pesto gnocchi alone, as a side of some sort, but, pesto with the green beans… just didn’t mesh for me. And a HAPPY THANKSGIVING to all of you for the rest of your week! My Thursday, Friday and Saturday will consist of eating all of the delicious Turkey leftovers! Hope you enjoyed the recipes!